Concrete patios and driveways are practical, affordable, and durable. With design innovations like adding color stains, stamping, and sealers, concrete is no longer just a hard, dull gray surface and has even moved inside the home as an interior floor or countertops. Even though outdoor concrete is exposed to harsh weather and lots of use, with just a bit of care, concrete patios can look beautiful for decades. Most patios only need to be cleaned once per year. 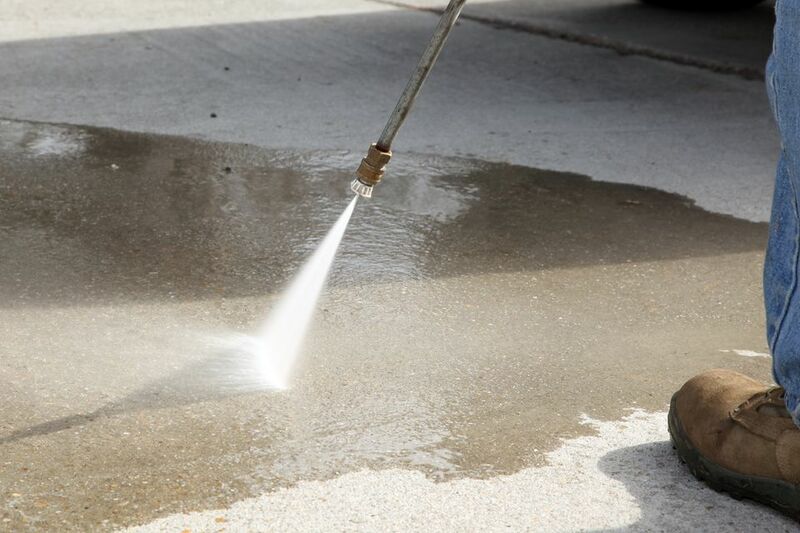 Spring is a good time to clean concrete to clear away winter mud and grime. However, if you have used the patio over the summer and have food stains or drips of grease from a barbecue grill, you may want to add an additional thorough cleaning in the fall. Just a few supplies and a bit of elbow grease are needed to clean a patio. If the concrete is heavily stained, you may wish to use a power washer and a commercial cleaner recommended for the washer. Do not use a vinegar and baking soda mixture in a power washer. Choose a mild, overcast day to tackle the job, so that the cleaning solution will not evaporate too quickly. Remove all furniture, grills, plants, and toys from the patio. Use a broom or leaf blower to remove all loose dirt, leaves, and debris. Then use a garden hose with a spray nozzle to wet down the concrete. Pour one cup baking soda into a plastic bucket or bowl. Slowly add two cups of distilled white vinegar. The mixture will foam up but will settle if you mix it slowly. The consistency should be like a cream soup—thick enough to cling to the surface but not too thick to spread. Spread the mixture over the concrete with a sponge mop. Depending on the size of the patio, you will probably need to double or triple the ingredients. Allow the mixture to sit on the concrete surface for around 30 minutes. Use a nylon-bristled scrub brush (metal brushes can leave small pieces of metal in the concrete that will rust) to clean the entire surface. Use a scrub brush with a long attachable handle to save your back and knees. Rinse away the cleaning solution. Make sure to spray clean water on any shrubbery or grass next to the patio that may be spattered with the vinegar and baking soda. Allow the concrete to air dry completely before replacing any furniture and accessories to prevent staining. Rust stains from furniture legs and grills can be especially difficult to remove. In some areas of the country, the soil contains so much iron that any red mud stains must be treated like rust stains. Rust stains should be treated before removing mildew stains. Chlorine bleach can permanently set in rust stains. Sweep away any debris from the stained area. Follow the directions on the packaging and apply the cleaner to the stained area and scrub with a nylon-bristled brush. Rinse away cleaner and allow to dry. Repeat if stain remains. Quite often, heavy mildew stains will appear on concrete due to outdoor dampness. To effectively kill the mildew spores and remove the black stains, you will need to use chlorine bleach. Oxygen-based bleach will remove the stains but will not kill the spores. After you have removed everything from the patio, mix a solution of one-part chlorine bleach to two-parts water in a plastic bucket or spray bottle. You will need to protect the lawn and shrubbery from the solution with old towels or plastic sheeting. The bleach will burn and possibly kill greenery. Always wear old clothes to prevent bleach spotting and protective eyewear for safety. Spray on the bleach solution or use the mop to spread the solution onto the mildew-stained areas. Allow the cleaner to work for five to 30 minutes depending on how heavy the stains are on the surface. Scrub the concrete with a nylon-bristled brush and then rinse thoroughly with the garden hose. For extremely heavy stains, a power washer provides a much stronger stream of water to blast away the grime. Use a hose to rinse greenery after the patio is clean. Grease stains should be treated as soon as possible after they happen because concrete is porous and the longer the grease sits, the deeper it goes into the surface. Be patient; you may need to treat grease stains several times before they disappear. Sprinkle the grease stain with a thick (at least one-inch) layer of kitty litter or cornstarch. Allow it to remain on the stain for 24 hours or up to three days to absorb the grease. Sweep up the kitty litter and inspect the stained area. If it remains, repeat step one. If the stain is nearly gone, spray the area with a commercial cleaner that contains a degreaser and scrub the stain with a nylon-bristled brush. Rinse with a garden hose and allow to dry. Repeat if needed.